Reiki, (pronounced Ray-key) is a Japanese name consisting of 2 words Rei and Ki, with Rei – meaning “God’s Wisdom or the Higher Power” and ki – which is “Life Force Energy”. This energy flows through us all and just happens to be all around us. So in essence, Reiki is a form of “spiritually guided life force energy” that is channelled through the practitioner to the recipient. Reiki is a gentle but yet very powerful system of hands-on healing and is easily learned by anyone to heal themselves, others, plants, animals, present, future and past events… And so much more! Reiki helps to harmonize body, mind and spirit for yourself or anyone you want to help and is in fact one of the most powerful energies in the world. Some say that Mikao Usui discovered Reiki when he was struck in his third eye by a strong light, which came out of the darkness after a 21 day fasting meditation on Mount Kurama, imbuing him with the ability to heal. Some say he experienced a sudden flash of deep understanding and suddenly realized how a particular aspect of the vital life force energy already flowing within him could easily be accessed and used for both healing and accelerating self-realization. In this instance, Reiki was born. Over the years many different forms of Reiki and other types of energy systems have surfaced due to the discovery of the initial Reiki Healing Energy system. Reiki is as we know a powerful form of hands-on or distant healing, but there are many different types of energies that work differently and feel differently than Reiki. Usui Reiki Ryoho is the first band of Reiki. There are actually 8 bands of Reiki and each band of Reiki is based on a higher frequency of energy that is being transmitted from source to the practitioner. Now you have the opportunity to instantly learn how to channel the power of Reiki to heal yourself, as well as, others both in person or distantly right now. Learning Usui Reiki Ryoho is the first step in the process. In order for you to advance further later on for many other types of Reiki systems, the prerequisite is that you have to be an Usui Reiki Master to receive the system. What this means is that your body is vibrational prepared to receive a higher frequency attunement. About the ONLY reason you would need to join a Reiki class is to get the full hands-on experience. However, this is going to cost you quite a bit of money if your spiritual path has led you to become a Reiki Master. Typical classes to complete your Usui Reiki Ryoho 1, 2, and Master level can cost $500 – $10,000 or more. I believe that everyone should have the ability of healing themselves and others without having to spend a huge amount of money in the process. Everyone possesses the ability of healing themselves and others. You are born with Reiki. However, there are blockages that need to be cleared from your body in order to unlock your Reiki abilities. Basic is the Usui Reiki Master Attunement Session. This session comes with a chi-ball attunement that you will be able to call down at your leisure and comes with all manuals and a certificate of lineage. 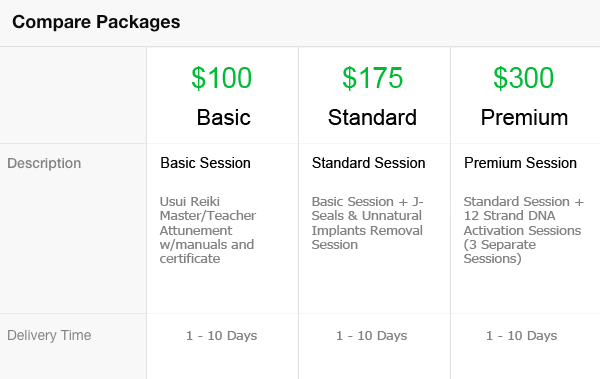 Standard is the Usui Reiki Master Attunement Session, plus J-Seals and Unnatural Implants Removal Session. This will enable you to release all energetic blockages that will allow you to truly feel the flow of Reiki and increase your effectiveness in your healing abilities. You don’t need to receive 3 separate attunements in Reiki. There’s a complete misconception on this. The fact is that energy has no limitation and neither do you. You already posses what you need to become a Reiki Master, you just have to awaken it and allow it to come to fruition. You will now know what it is like to become a real Reiki Master and you won’t have to spend months or even years waiting to do it either! This is one of the biggest issues you will face when it comes to Reiki classes – they require you to work at each level for a certain time, sometimes several months to a year before you can progress to the next level. Having the ability of helping people does in fact make you feel good that you can actually change lives and make things better and easier for people. When you become attuned in to Usui Reiki Ryoho your body will go through cleansing stages. These cleansing stages allow the blockages to clear out more and more and allows Reiki and other healing energies to flow through you much stronger. Choosing to become a Reiki Master has many advantages and you can incorporate Reiki into all aspects of your life each and every day. once again another stellar experience with jaye, 4th time ive come back it’s that good! love your work jaye, keep it up.